But I speak silence... no one understands. She is a poet and as such she has tried to talk about the unspeakable problems of persons with disabilities in her own poetic way. But, the hectic world of ours appears to be too busy to understand the silence spoken by her. Therefore, there are disability activists that try to raise awareness among people about their cause by organizing various events. Zahida is such a person. Zahida was 1-year-old when polio paralysed her legs. When she grew up, her parents have helped her complete her education. She completed her M.A. in Economics and started her career in an NGO [non-governmental organization], Strenghetening Participatory Organization (SPO). She does not have a bleak outlook towards life. She has worked for the rights of persons with disabilities for nine years. Today, she is the president of an NGO that works for the betterment of such individual. She has organized several events to engage common people, social workers, politicians, businessmen, industrialists and bureaucrats in the service of persons with disabilities. She is always busy in her capacity as an NGO president. When I asked her about the most memorable event for physically challenged individuals that she had attended or organized, she told me that once she attended a whole month of events for persons with disabilities in Bangkok. That particular month was the most memorable event of her life. 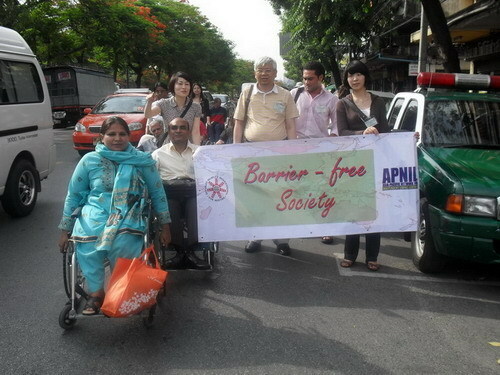 “Asia Pacific Month of Disability” was a series of events that was held in the month of June 2010 in Bangkok. 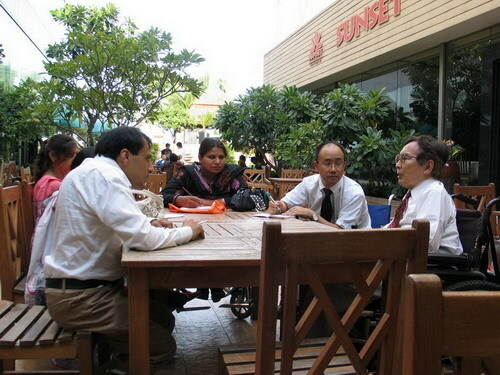 The event included conferences and seminars on various issues regarding the problems of persons with disabilities. The aim was to stress the implementation of the Convention on the Rights of Persons with Disabilities and establishment of barrier-free environments in society for individuals so afflicted. Most of the participants were persons with disabilities. They came to the events on their wheelchairs. Pacific Network of Independent Living (APNIL), Disabled Peoples’ International, Asia Pacific Region (DPI-AP) Regional Assembly, Disabled People Organizations (DPO) United and United Nations Economic and Social Commission Asia Pacific (UN ESCAP) and Society for Special Persons(SSP) took part in the event. 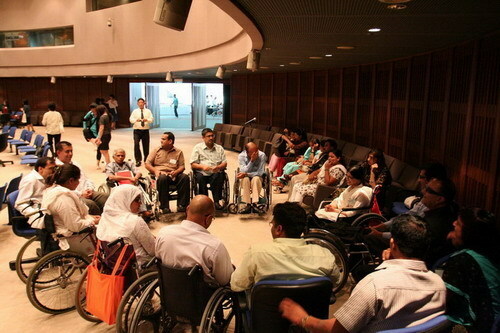 The first event of the month was held in the form of a seminar organized from June 18-19 by Disabled Peoples’ International Asia Pacific Region (DPI-AP) in collaboration with Asia Pacific Network for Independent Living Centers (APNIL) and The Nippon Foundation and ABILIS Foundation. 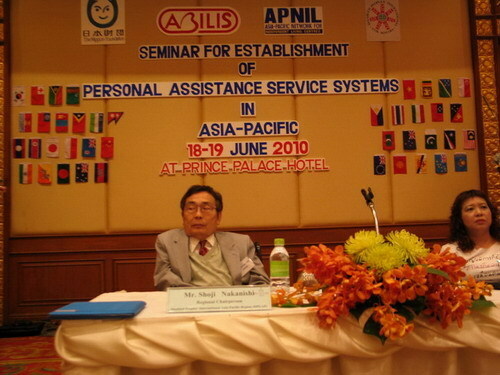 It was held at Prince Palace Hotel, Bangkok, Thailand. The aim of this seminar was to ‘build capacity of leaders of independent living in Asia-Pacific for establishment of personal assistance service systems in their own countries’. At the seminar, the speakers presented their papers and conducted discussions. They shared their experiences and knowledge on personal assistance service systems and projects in Australia, Korea, Japan and developing countries. They gave their own suggestions and recommendations on a ‘common basis to promote personal assistance service systems in the Asia-Pacific region’. The same organization put together the second event of the month at the same venue on the next day (June 20, 2010). 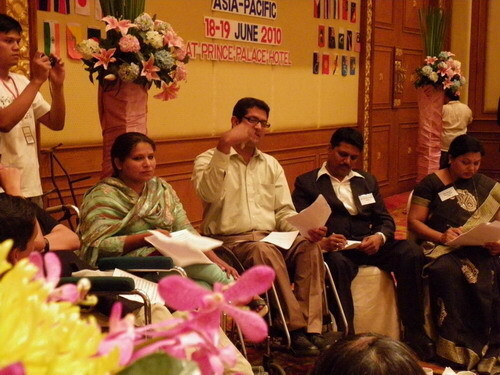 The event was entitled DPI Asia-Pacific Regional Assembly. The assembly holds its session every two years. In its proceedings, the assembly selected two World Counselors: Mr. Jabed Abidi of India and Mr. Abdul Sattar Dulal of Bangladesh. In addition, the MNAs of the assembly made their long-term plans about the betterment of persons with disabilities in the next decade. 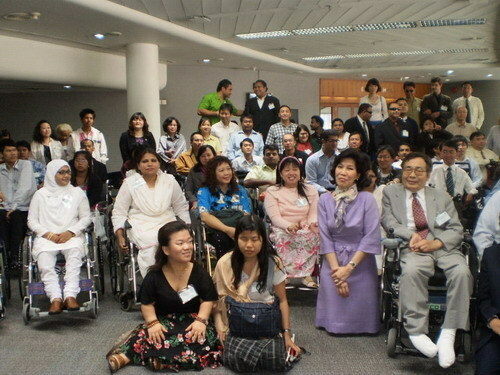 The third activity of the month was held on June 21-22, 2010 at United Nations Building Bangkok -- a meeting of 180 delegates of disability movements. 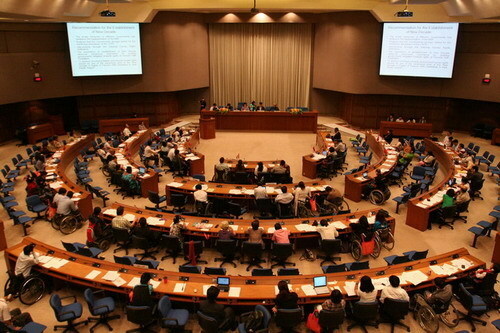 The conference was entitled ‘The Asian and the Pacific Persons with Disabilities United: Towards the Establishment of the Regional Decade on the Effective Implementation of the Convention on the Rights of Persons with Disabilities’. The main objective of the meeting was to review the implementation of the Asian and Pacific Decade of Disabled Persons, 2003-2012, to consider the possibility of a new regional decade for persons with disabilities for the period 2013-2022 and to explore sub-regional approaches to promote the effective implementation of the Convention on the Rights of Persons with Disabilities (CRPD). At the end of meeting participants came with “Bangkok Recommendations” for UN ESCAP Stake-holders meeting. This was a successful event at the floor of the United Nations. 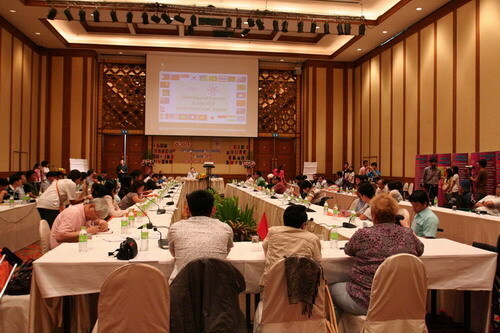 At the end of month a UN ESCAP stake-holders meeting took place at the UN building in Bangkok. This meeting was attended by Government Officials responsible for Disability Issues, International NGOs, Disabled Peoples Organizations (DPOs) and All UN bodies like WHO, ILO, OCHR. The purpose of the assembly was to come up with n roadmap of work for the next decade for persons with disabilities. After an extensive three-day (23-25 June) discussion, the participants came up with a feasible roadmap. One of the slogans of the meeting was 'Nothing about Us ! Without Us!'. The slogan stressed the importance of including persons with disabilities in the decision-making processes of the affairs that are related to them. 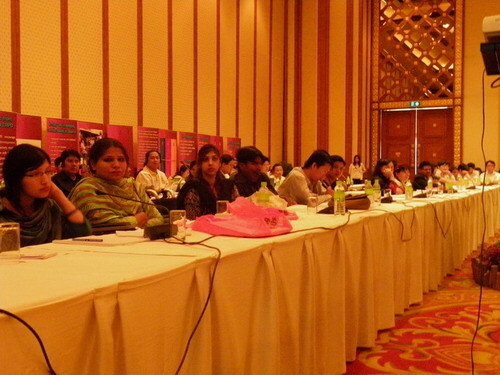 Zahida also attended a group meeting of the delegates from SAARC countries. The meeting was chaired by Ghulam Nabi Nizamani. Zahida took part and contributed actively in all above mentioned events. She gained a lot from this experience. 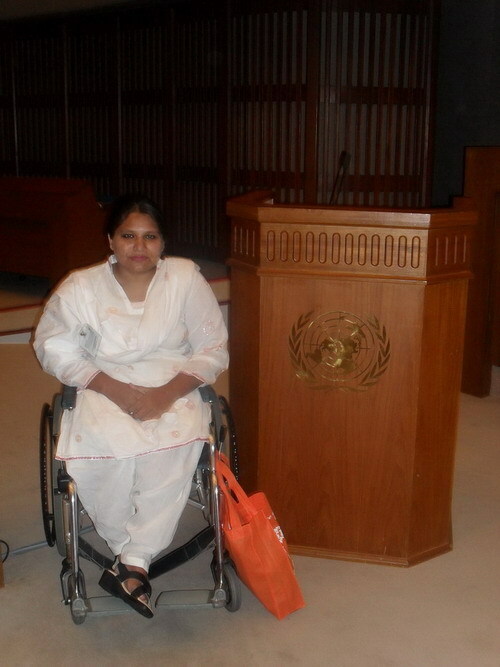 She came to know about various problems of persons with disabilities in different countries. She also came to know about various successful projects for the betterment of such individuals that that are being run in various Asian countries as well in Australia. In addition, she had an opportunity to meet with the DPI chairperson . For one complete week she had to attend meetings and conferences. She had to work from morning to evening. Talking about life in Bangkok from the point of view of a person with disability, she says that Bangkok is a barrier-free society. With your wheelchair you can go anywhere and enter any buildling because special passages have been built for persons on wheelchairs. 'Realization of such a barrier-free environment is what we want as persons with disabilities', she maintains.